I love the trees in Australia. Of course, the eucalypts are my favorite and are by far the most diverse and most ubiquitous. But paperbarks are high on the list of other trees I fancy. I love the willowy leaves and the soft, pale, tattered bark that peels off in thin layers. Of course, I suspect part of the reason I love paperbarks is that I generally saw them in fabulous, remote settings, often surrounding billabongs. We saw a lot of paperbarks in Kakadu. Paperbarks are actually not a specific species, but rather a number of related trees that have the same papery bark. These Aussie natives are members of the myrtle family (Myrtaceae) and belong to the genus Melaleuca—which means they are related to the trees from which we get tea tree oil (Melaleuca alternifolia). The Melaleucas from which tea tree oil is made grow in New South Wales, so that’s not what we were seeing in Kakadu. Actually, it would be more accurate to refer to tea tree oil as paperbark oil. While many paperbarks are called tea trees, true tea trees are a different genus— Leptospermum—though both are in the myrtle family, so no doubt the confusion is due to a family resemblance. 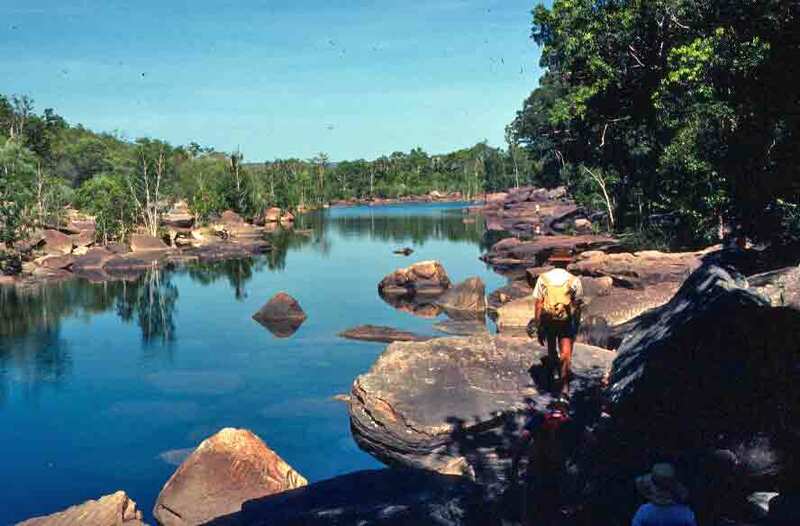 In Kakadu, the paperbarks grow primarily on the edges of creeks, billabongs, lagoons, floodplains, and permanent waterholes. 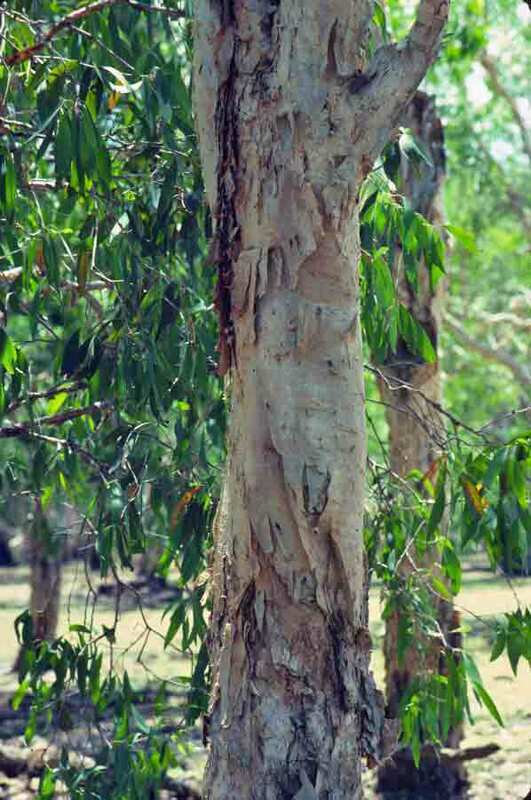 The broad-leafed paperbark and weeping paperbark are the main species seen in these wetland areas. It was spring, so the Melaleucas were in bloom, and the heavy, honeyed fragrance of their flowers suggested to me that they might be popular with bees. The photo below shows the wonderfully papery bark of a Melaleuca tree we saw by the side of a billabong in Kakadu. Pretty much everywhere you go in the semi-arid regions of Australia, the landscape is dotted by termite mounds. In the north of Queensland, I had seen gnarled, gray termite mounds that were three to five feet high standing amidst fields of golden grasses. As I had neared Darwin, I saw three- to five-foot-high termite mounds both punctuating the grasslands, but also leaning against collapsing trees. But in Kakadu, we saw astonishing mounds that were as much as 20 feet tall. Termites need humid, protected environments, so they create massive nests, almost entirely underground. To stay protected, they build mud shelter tubes for traveling to feeding sites—and a mud sheltering tube is sometimes the first indication that a tree or house has visitors. The giant mounds are made of mud and termite saliva, and they are of a hardness somewhere between baked pottery and concrete. These mounds stand above the nests and help control airflow and temperature in the extensive network of subterranean tunnels. Because they are largely made of mud, the color of the land affects the color of the termite mounds. 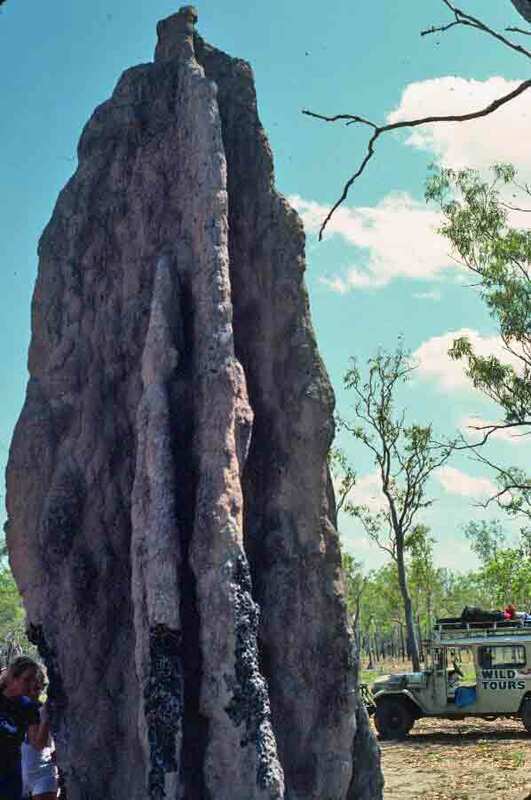 When I reached the iron-rich Hammersleys in Western Australia, the termite mounds I saw shared the rich rust color of the surrounding soil, but in Kakadu, they were gray. However, in Kakadu, they also appeared more carefully constructed, more castle-like. Still, in both places, standing next to a twenty-foot hill created by insects makes an impression. 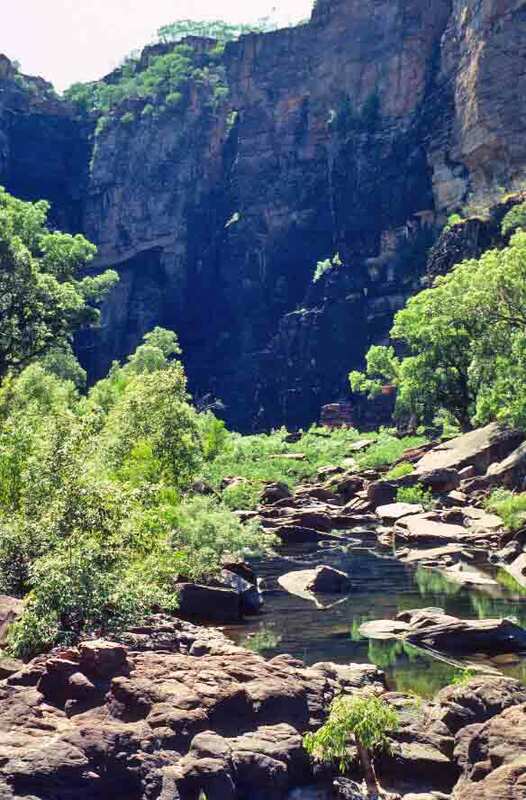 The mound below was one we stopped to admire on our last day in Kakadu. I had originally thought that this blog would be all I’d need—that I’d share other travels and interests here. However, this is pretty clearly a travel blog, with most of it’s focus on Australia, so I decided to start another blog for my equally serious food interests. That blog is The World’s Fare. The original idea was that The World’s Fare would be a book—the history of the 100 most important foods in the world. This would be followed up by other food histories—less important foods, key processes (cooking, curing, distilling, etc. ), and almost universal forms foods take (pies, noodles, dumplings, stews). But after two years, my agent has given up on placing the book—I don’t have a show on the Food Network, so publishers aren’t interested. So I’ve decided to share everything that would have gone into that entire series of books on my new blog, but also add tales of my more food-oriented travel. Food history, international travel, and exotic recipes all seem to fit comfortably under the title originally planned for my book—so welcome to The World’s Fare. Of course, I want you to keep coming back here, as well. I’ll still be adding more photos and information about Australia. (I’m less than one-fifth of the way through the book, as far as illustrating my adventures—and then I’ll start on the three return trips.) I just thought you might like to know that there are further adventures on my second site. As you might imagine, a towering plateau such as the Arnhem Plateau has more than a few waterfalls. The afternoon of the day we visited Jim Jim, we put on our swimsuits and hiking boots and headed for Twin Falls. Twin Falls was a delight. Getting in was an adventure, but it was worth the effort. However, from what I’ve read, among the many alterations made in Kakadu was altering the approach to the falls to make it more accessible. No more paddling in on air mattresses (lilos in Australia), sliding over huge sunken boulders. Now you take a boat part way and then there’s a boardwalk. Well, I suppose that means more people get to see it. But the trip in was so much fun, I can’t help but think that something is lost. Of course, having now read about saltwater crocodiles appearing in the approach to some of the falls, and knowing that these savvy hunters would notice if lots more humans started showing up, it’s probably just as much a safety issue as it is an accessibility issue. The photo below is from the base of the falls looking back toward the spit of land where we dumped our lilos when we went for a swim. The picture is a little deceiving, because it’s hard to tell how large the area is. Look for the little humans below the short trees on shore to get a sense of scale. The spot was glorious, and while I’m disappointed to learn that the adventure has been somewhat diminished, it’s nice to know more people get to appreciate Twin Falls. They say that what you don’t know won’t hurt you. Hmm. Maybe it should be rephrased as what you don’t know won’t scare you—at least not until you find out later. 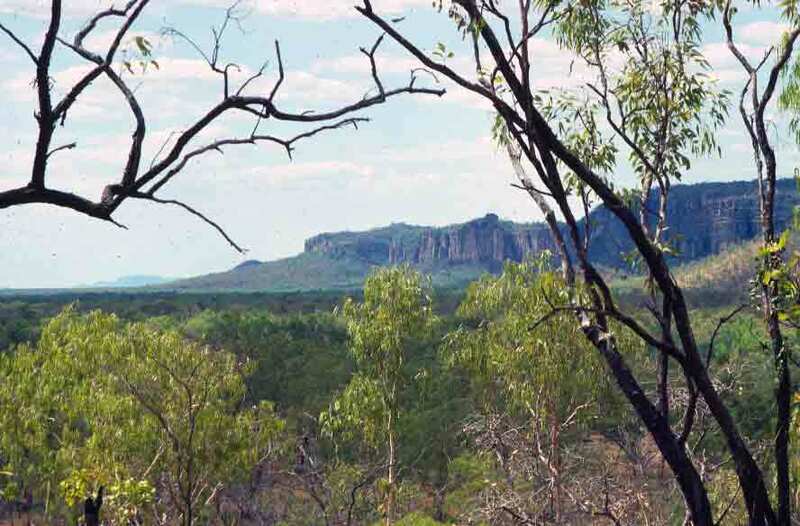 Our guide chose not to share the following information with us, which I found on the Australia Government Department of the Environment site long after I had returned home from my first Australia venture. 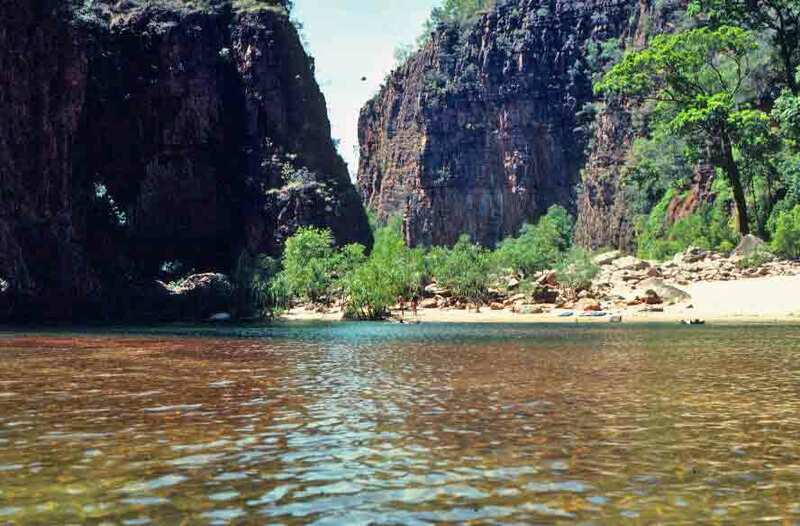 Some visitors choose to swim at their own risk, in selected natural plunge pools and gorge areas such as Gubara, Maguk, Jim Jim Falls, Gunlom, Jarrangbarnmi (Koolpin Gorge) and in creeks on the plateau above Twin Falls and Gunlom. These areas are surveyed for estuarine crocodiles prior to opening each dry season. There remains some risk that estuarine crocodiles may move into gorges and plunge pools during the dry season. Visitors who choose to swim at the Jim Jim Falls plunge pool do so at their own risk. Please note the advice on our visitor safety page regarding crocodiles and all crocodile warning signs on site. Do not enter the water downstream of the Jim Jim Falls plunge pool. Estuarine crocodiles may be present. Actually, the crocodile warning signs arrived after our visit—along with other changes that make the park more accessible to a larger number of tourists. Oh, well, ignorance is bliss. We thought the only challenge was the house-sized boulders we had to climb over as we approached the sandstone walls that surround the plunge pool. And that cool, clear water was mighty refreshing after the long, hot hike/climb/scramble up the gorge. Leaving Cooinda and Yellow Water behind, we began the long, rough drive deeper into the wilderness. The great, craggy walls of the Arnhem Plateau rose in the distance, looking like the lost world from Sir Arthur Conan Doyle’s tale. If “Arnhem” doesn’t sound like an Aboriginal name, that’s because it’s not. The top end of Australia was sighted in the 1600s by Dutch traders who were looking for spices in India and the Molucca Islands. They thought it was desolate and not worth checking into further, as they didn’t see any real profit in it (no spices, gold, silk, tea, or other trade goods), but they still managed to leave a handful of Dutch names behind in this area: Van Diemen Gulf, Groote Eylandt, and Arnhem Land. This particular stretch of coast was visited in 1623 by Dutch explorer Willem van Colster. Van Colster’s ship was named the Arnhem, after an ancient ship-building town in the Netherlands, and he named this bit of land after his ship. One of life’s great joys is discovering people who share your love of something that is important to you. I love nature and beauty, and that particular interest has led to a friendship with Carol Freeman, an outstanding nature photographer who shares my love of beauty. Sure, there are differences in our approaches—I’m more international and am as drawn to rocks, ruins, and open-air markets as I am to birds and flowers, while Carol has focused her energy on recording and protecting rare and endangered species, primarily in the Midwestern U.S.—but the same delight in beauty and reverence for creation can be seen when comparing our nature photography. However, Carol, who works for the Nature Conservancy and other ecologically oriented groups, is a full-time professional, while I’m primarily a writer who uses photography to supplement my words—and that difference shows both in Carol’s level of skill and depth of work. So I thought today, I’d give you one of Carol’s photos, and then send you to her website, so you can revel in the glory of her work. 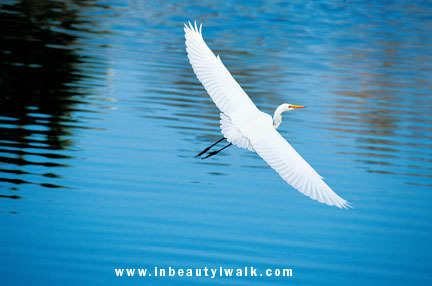 Her site is “In Beauty I Walk,” and you’ll see why once you visit it.